She may not look much like a yacht..but this is the Royal Yacht Brittania, the floating palace belonging to Her Majesty Queen Elizabeth II. 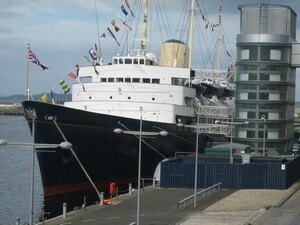 Edinburgh is now proudly home to her Majesty's Royal Yacht Brittannia now berthed at Leith, Edinburgh, once home to the Royal family and now open to the public. Brittania was built in Scotland at the shipyard of John Brown & Co. Ltd in Clydebank, West Dunbartonshire and launched by Her Majesty Queen Elizabeth II on 16 April 1953. 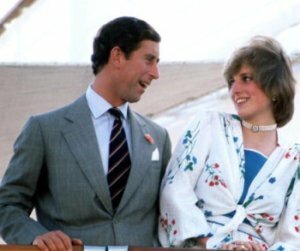 The Prince of Wales and Diana, Princess of Wales spent their honeymooning cruising aboard Britannia in 1981. Brittania has taken the Queen and other members of the Royal family on 696 visits to foreign countries and 272 visits in British waters. During her working life, she has travelled over 1,000,000 miles. First female James Bond star, Ursula Andress celebrated her 70th birthday aboard Brittania on May 18th, 2006. Brittania is equipped with (amongst other things!) a 24 hour laundry (the Queen had to change clothes several times a day! ), a garage for her Rolls Royce, a fully equipped sick bay, an operating theatre in case of a medical emergency whilst at sea, a mail office, and strangest of all a tiny gym inside the ship's huge funnel! 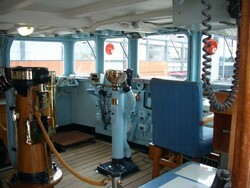 The decks are two inches thick. For those who are not so interested in statistics.. 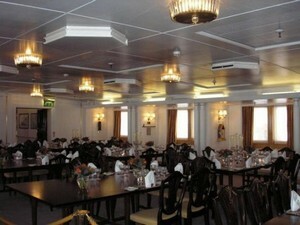 This is the dining room...doesn't look much like a yacht here either! 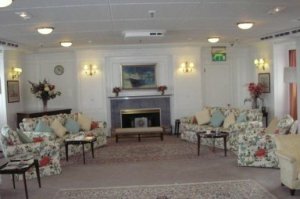 The Queen originally wanted to have a real fire in the fireplace, but when she heard that a member of the crew would have to stand next to it constantly ready with a bucket of water (according to naval regulations), she consented to an electric one.. 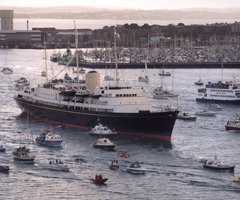 There are so many fascinating stories associated with the Royal Yacht Brittania..she is a piece of floating history, famous throughout the world, visited by heads of state, crowned heads, celebrities, and certainly worth visiting while you are in Edinburgh.